An Informative & Practical Guide to Assist Inclusion in the Classroom by Teachers, for Teachers! Seating in the classroom should be arranged into a semi-circle (U- shape), to allow the Deaf students to have visible access to the mouths and faces of each student in the classroom, as well as the teacher. This enables the students to be able to either read lips or facial expressions, allowing them to fully participate in class discussions, and knowing who is speaking and seeing their reactions. 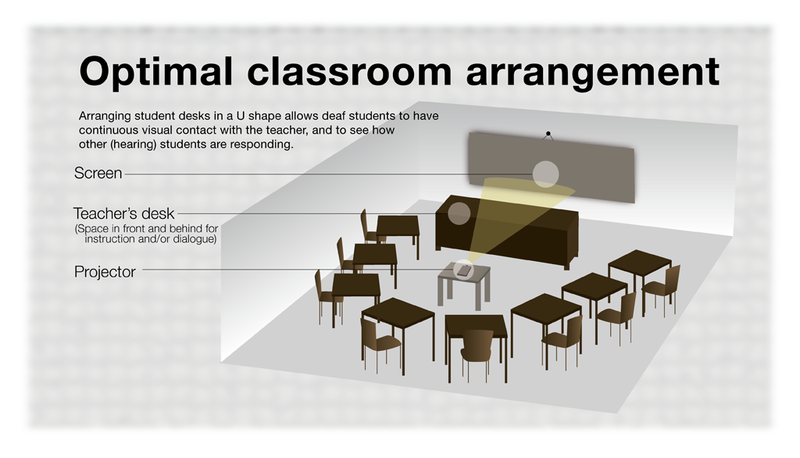 This diagram incorporates the U-Shaped formation of desks where each student is in clear sight of each other, along with the teacher being clearly visible. For times when students are asked to go to the carpet for various lessons, have students sit in a circle or semi-circle. Having the carpet in the center of the U-shape arranged desks optimizes the space in the center that might otherwise be wasted. Within the classroom, have all desks and tables arranged in a circular or semi-circular fashion as this enables group work with the Deaf Students which creates a successfully communicative environment for peers. Having a computer in the classroom would be a great tool and could be used to look up hand signs, or be used as another way to communicate effectively. However, teachers must be very careful where the computer is placed. 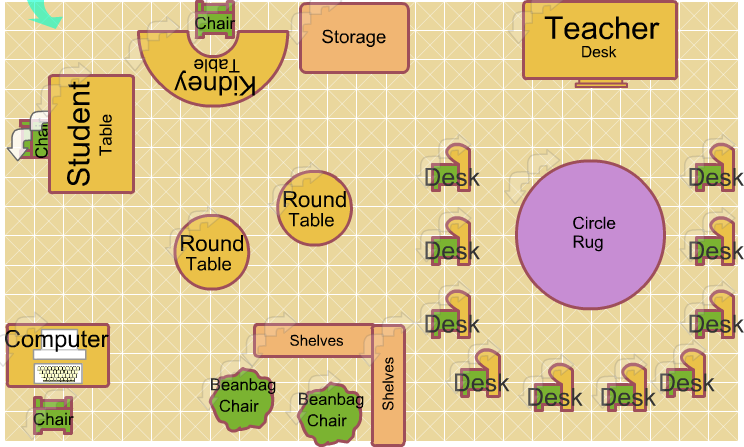 It is recommended that the computer desk be located in a corner of the room, in a position where, when the student sits, they are facing the rest of the classroom. This avoids scares or surprises, as Deaf students will not hear others approaching. Therefore, this type of positioning creates a space where the students can still be aware of their surroundings. In addition, provide a shelf where all students can access friendly and appropriate resources about Deaf Culture and Sign Language, as this allows students to connect to Deaf students on another level thus creating a community inclusive of the Deaf Student in the classroom. This room still allows for those quiet spaces that may be needed for students to separate themselves for their own quiet time to focus on their work or other activities.